Sometimes life can make you feel like a loser. It doesn’t always pan out the way we thought it would or should. And it’s easy to look at the goals and dreams God has placed in your heart and wonder if you’ve screwed everything up through the wrong choices, trusting the wrong people, or by just not being, you know, enough. But instead of asking if you’ve failed, ask yourself if you’ve grown in your relationships this past year. Ask yourself if your trust in God has grown. Ask yourself if you’ve made progress in becoming more of the son or daughter that God wants you to relax into. Sometimes the toughest seasons are about letting down your guard and remembering that you and I are not God. Those who think they can do it on their own end up obsessed with measuring their own moral muscle but never get around to exercising it in real life. Those who trust God’s action in them find that God’s Spirit is in them—living and breathing God! 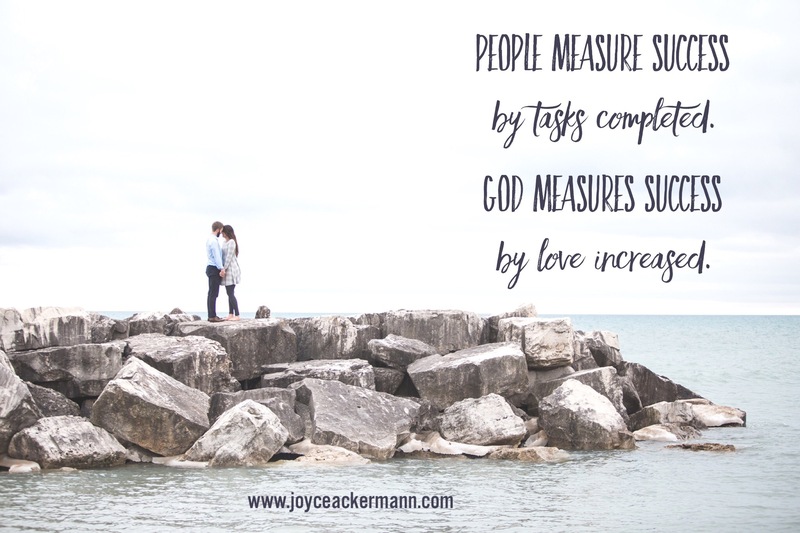 As people, we measure success by tasks completed but God measures success by love increased. Which can be really difficult to wrap our hearts around. I went through an amazingly intense season several years ago. God took me through about 9 months of teaching me about the gift of discernment. And when God teaches me stuff, it’s not usually in a nice, college lecture type setting. It’s always in a very life-in-the-trenches-so-you-can feel-this-and-have-some-tactile-experience sort of way. Okay, yeah, it was pretty much like boot camp. But He taught me that I was powerful. And I watched as afterwards, my prayers moved mountains. My words helped set people free. I could change the atmosphere in a room, just by walking into it. I kinda felt like Bruce Almighty. And then the seasons changed. And God was no longer teaching me about His power in me. He started whispering about my humanity. The things that irritated me. The situations in my life that had brought me to my knees. And I suddenly went from being the most powerful I had ever been in my life to feeling the weakest. Driven into the proverbial wilderness of life. To figure out with God, what was going on in the hidden places of my heart. And this change of season has not been an easy one for me. Time and time again, I’ve had to fight the thought that I’ve failed. That somehow I’d fallen from grace and just royally screwed everything up that God was doing in me. That He was throwing His hands up in air and you know, just done developing me. Meanwhile, I plummeted from the mountaintop straight into the valley, to learn how to embrace the divine while my feet still remained on Earth. To add insult to injury, there’s quite a few people around me who are stepping into their destinies and God-given dreams this season. So where am I going with this today? I dunno, maybe just a reminder to you and me that God really, truly does know what He is doing. And that you haven’t failed. Whether you’re on the mountaintop, in the valley, or somewhere in between. He is helping us to become more aware of His love for us and to heal us so that His love flows more freely out of us. And while our eyes have been focused on task-based success, His eyes have always been on you and me. You can get Joyce’s book, Scattered, Finding God in Your Story, here.